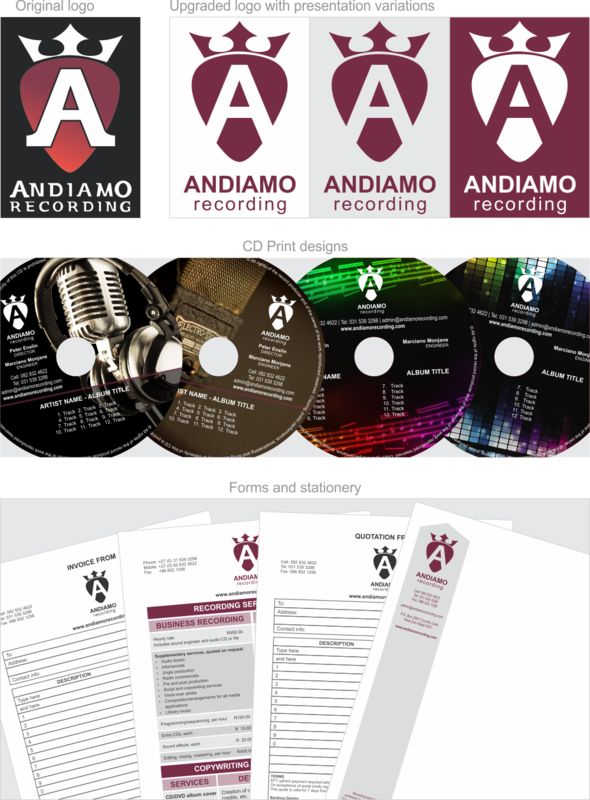 Today we showcase a small branding project completed for Peter Enslin of Andiamo Recording Studio in Mt Edgecombe. Firstly, if you need professional recording for anything - including music, audio books, voiceovers, copywriting - don't even bother looking elsewhere. As a client, Peter was wonderful to work with, totally accommodating, professional and with great old-school principles that you don't see every day. After reading the feedback from clients on his website, it's obvious that he carries these qualities over into his recording work. We started with a basic logo that Andiomo was already using, and we just streamlined it a bit. This was then carried through to the company stationery: letterhead, email signature and numerous other forms. We also had fun creating a set of designs for printing onto recorded demo CDs. You can see everything below. And pop along to Andiomo's Facebook page for tons of interesting music- and recording-related info.